With more technological advancements, the new BMW 7 Series sets out its stall as the ultimate vehicle for luxurious driving pleasure. BMW has updated the 7 Series engine range to include a new eight-cylinder engine and an in-line six-cylinder unit with a plug-in hybrid system offering extended electric range. The new BMW 7 Series will continue to offer standard and long wheelbase variants The BMW 7 Series will continue to be offered in standard and long wheelbase body variants. The new BMW 7 Series incorporates an extensive design refresh at the front end that is now around 50mm taller at its foremost point. The traditional kidney grille is now significantly larger and features active air flap control with adjustable vanes that only open when the need for cooling air is increased. Wide-open air intakes for M Sport models have been updated and they feature C-shaped surrounds with integrated Air Curtains to underscore the positioning of air ducts at the outer edges of the front apron. The revisions also include aerodynamically optimised contouring of the front apron's lower border. With long wheelbase and short overhangs, a flowing roofline and the Hofmeister kink, the new BMW 7 Series has all the hallmark BMW design cues. Exterior mirrors attached to the window are surrounded by a thin stalk to further improve aerodynamics and the front side panels have been treated to a thorough redesign, too. Rear seat entertainment consists of two 10-inch full-HD displays, with access to navigation and online functions The rear-seat entertainment system comprises two 10-inch full-HD displays complete with a Blu-ray player. The system allows users to access the entertainment, navigation and online functions of the vehicle from the rear seats. The viewing angle of the screens, which now have touchscreen functionality, can be adjusted in accordance with the rear seat passengers' existing seat position. LED ambient lighting with a choice of six colours is available as standard. 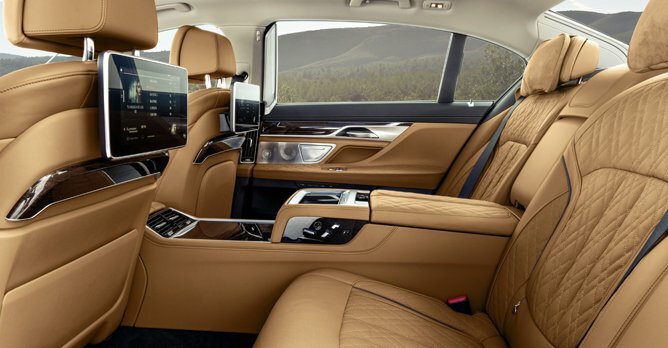 The new BMW 7 Series also includes the latest version of the BMW Touch Command unit. This removable tablet with a 7.0-inch screen can be used from any seat and even outside the vehicle. Standard specification for the new BMW 7 Series includes the BMW Intelligent Personal Assistant - an intelligent, digital helper who responds to the prompt "Hey BMW". This technology learns routines, habits and preferences to help the driver get the best out of the in-car functionality such as the seat heating or the places they navigate to. 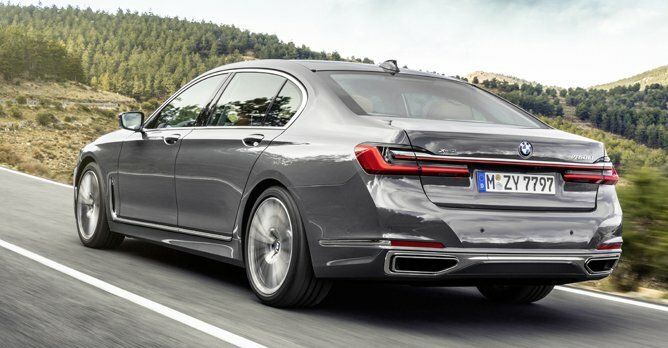 All variants of the new BMW 7 Series feature, as standard, adaptive suspension including electronically controlled dampers and two-axle air suspension with automatic self-levelling. Plus, the Driving Experience Control switch can be used to activate a range of damper settings to shift the emphasis of the driving experience further towards either comfort or sportiness. The ride height can be adjusted manually. For example, it can be raised by 20mm at the touch of a button on bumpy road surfaces or steeply angled ramps on the way into garages.